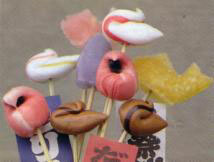 This kind of sweet belongs to the type of Dagashi, cheap sweets, which originated in the Northern areas of Japan. During the winter season, the womenfolk would take rounds to prepare some homemade sweets for the neighbours. 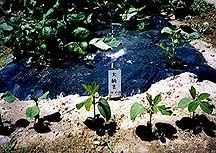 White sugar was not availabel during the Edo period, and the sweet taste was produced from rice decoctions (mizuame 水飴), red been paste and others. 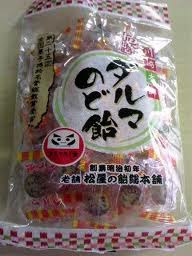 Nowadays, also rice cakes and other snacks in little bags are sold as dagashi, a cheap snack for kids. A kind of candy in red color and the form of Daruma san. On the seventh day of the first month and the third day of the third month of the old lunar year during the festival of Yakushi お薬師さん this sweet was sold. People who eat it will be healthy all year long. After buying it you have to roll it up the stairs to the Daruma statue in the Yakushi Hall 薬師堂 and then offer it to the 神棚 Shelf of the Gods in your own home with the wish for the child or children to grow up healthy and well. This custom was very popular until about 1910.
. Legends about Yakushi Nyorai from Miyagi . During the Edo period, rich people like the local lords and merchants could afford white sugar, but the poor people had to make do with other forms of sweeteners. These cheap sweets are very nutritious and healthy and are loved by young and old. Don's they look gorgeous? 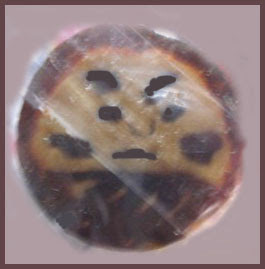 The black eyes of this representative of Northern Sweets, our Daruma sweet, are made of local black beans, grown with effort by local farmers. 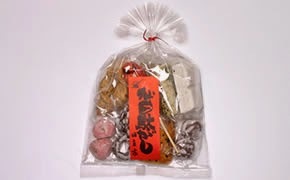 These assorted traditional confectioneries are widely known as Sendai Dagashi. Originally, Dagashi (meaning cheap sweets) were produced almost "spontaneously" in the everyday life of common peple.Their old unrefined shapes as well as the rural flavor still attracts the people of today. Original Sendai traditional hand-made confections are made with inexpensive ingredients such as beans and rice crumbs. Over 100 rare and nostalgic sweets are displayed here, including "Nankinto," a sweet that a European was carrying when he drifted ashore at Shiogama, during the Genroku period, and "Kumanejiri," a sweet made of powder ground by a very strong boy named Kumadoji using a mortar of heavy stone. Although the word itself implies something negative ("da" is "poor" or "cheap", and "gashi (kashi)" "confection"), you can't sniff at Dagashi. Actually, they are snacks of extremely low price and high quality (perhaps). They taste super. And more than anything else, they have given great childhood memories to people in Japan (maybe). Over 100 rare and nostalgic sweets are displayed here, including "Nankinto," a sweet that a European was carrying when he drifted ashore at Shiogama, during the Genroku period, and "Kumanejiri," a sweet made of powder ground by a very strong boy named Kumadoji using a mortar of heavy stone. 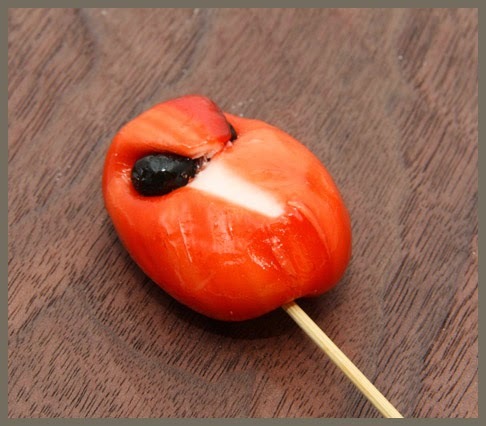 History of Dagasihi, cheap sweets from the Northern Regions. To withstand the long cold winter, mothers used to make them themselves too and enjoyed a sweet broth with the neighbours. Look at these links for such a Sweet Record Saijiki. From the numbers 1 to 12 in the middle you can guess the Month they are refering to. This is a Rice Cake representing Flower Petals 花びらもち, in the colors of Daruma. Click on any of the buttons on the left to see trays of delicious sweets. 師走　（平成１６年１２月） The 12 means December. 16 is the year Heisei 16, 2004. They are a speciality of the temple Jindai-Ji and are sold there too.
. Dorayaki (どら焼き - 銅鑼焼き) . After reading this story, a good friend just send me a packet of these sweets. Each one has a slightly different face. They are prepared in a long rod and then cut to bite-size. The cutting process is very important and done in a rythmical way that reverberates through the whole street leading toward the temple. To cut, as a symbolic act, is supposed to cut away evil influence and thus these sweets are especially "lucky". This is the original, how they should look. They are a favorite souvenir from a trip to the Temple. How are these sweets made, you ask? Well, here is the process (as far as I know). Stripes of colored candy mass are put together to form a figure, in our case big eyes, a mustache and so on. The mass is then stretched in the form of a stick (nowadays in a machine) with a diameter of a round mouthful size at a great length of more than one meter. This long stick is then cut by the "choppers", cutting once on the sweet mass and three or for times on the board to get a nice rythm, as a tourist attraction of course. is another speciality sold at the Kawasaki Temple. vendor of candy, candy sellers in Edo . The word dagashi originally referred to cheap candies of low quality, but over time the word came to be used for candies children can easily afford with their small allowances. The variety of dagashi is quite amazing. The types of candies and snacks that can be bought include candy drops, chocolates, cakes, juice powders that you dissolve in water to make juice, rice crackers, flavored squid, and many, many more. They are wrapped in colorful packages, and some come with a sort of lucky draw that allows you to claim a second candy or snack if you get a win. Until the 1960s or 1970s every Japanese town had a dagashi store, where coin-clutching children from the neighborhood would gather and hang out with their friends. The shops were filled with candies of every color, and they also sold toys - spinning tops, menko playing cards, handicraft sets, marbles, and so forth. Some shops even had games that could be played there or served a kind of savory pancake called okonomiyaki. The candies and toys were all very cheap, costing from 5 to 10 yen. The kids would compare their budget with what they wanted and think carefully over what to buy or consult with their friends. They would become friends with the woman running the shop (it was more often a woman than a man), who would teach them lots of things. 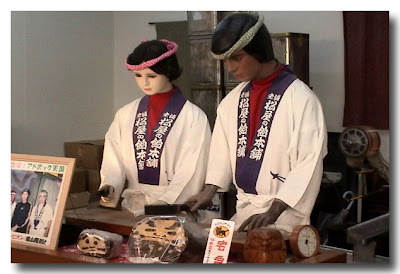 Over the last few decades, though, traditional dagashi stores have gradually disappeared from the towns. As Japan's economy developed and children came to have more money in their pockets, they began buying more expensive snacks at supermarkets and convenience stores instead of dagashi. And because birthrates have been falling in Japan and there are fewer children, it has become difficult for stores that rely only on children to stay in business. Nowadays dagashi are more often found in convenience stores and 100-yen shops.